Turn refrigerated biscuits into a delicious Cinnamon Swirl Coffee Cake Recipe. Our Cinnamon Swirl Coffee Cake Recipe features pecans and vanilla pudding. Go ahead and try to tell us there are other ways you would like to spend your morning. We can wait! Spray 12-cup fluted tube pan with cooking spray. Sprinkle 1/2 the pudding mix evenly on bottom of pan. Top with 1/2 the pecans; set aside. Combine cinnamon and sugar; set aside. Separate dough into 20 biscuits. Place 10 biscuits in pan, slightly overlapping. Sprinkle with remaining pudding mix, remaining pecans and 1/2 the cinnamon-sugar. Drizzle with 1/2 the butter. Top with remaining biscuits, cinnamon-sugar and butter. Bake 30 min. or until golden brown. Cool 1 min. in pan; invert onto serving platter. Serve warm. 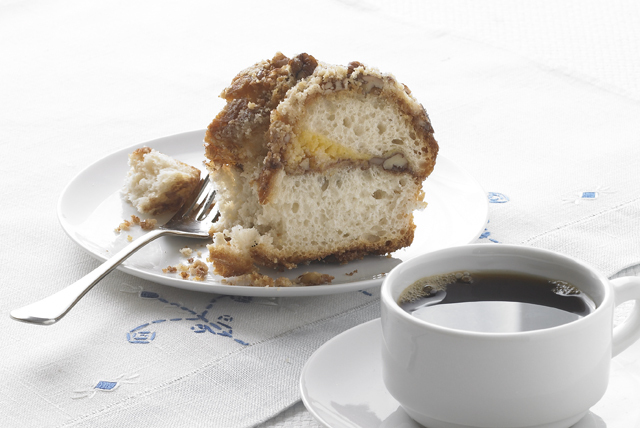 A warm coffee cake makes a great addition to a brunch menu that will feed a crowd. 12 servings, 1 piece each.